This beautiful 5000 sf house, built in 2008, is located on a private dead end street offering a private setting. It has 7 bedrooms (4 bedrooms are master suites) and 5-1/2 bathrooms. The house is located at 33307 Argyle Lane, one block west of Coastal Highway, making it a short 4 block walk to the beach. There is a traffic light with a pedestrian crosswalk at the highway. The inground swimming pool and volleyball court with imported beach sand in the rear yard, as well as a basketball backboard out front, make the house a center of activity for those not going to the beach. The quiet town of Bethany, with it's restaurants and shops is an 8 block walk or short drive away. Tax free shopping at the 140 store factory outlets is a 20 minute drive up Coastal Highway in Rehoboth. It is the perfect house and location for a multi-family vacation, family reunion, golf groups, ladies' weekends, religious and business retreats. There are numerous golf courses in the area open to the public. NOTE:The street sign says Argyle Lane, but it is also called Eugene Lane on many map search engines and GPS systems. The house will comfortably sleep 23 adults and children. #1 King Bed - first floor master suite with stall shower and Jacuzzi tub. Please note that there is no landline telephone service at the house. 5 adult bikes, 2 small kids bikes, Other kids bikes. pool is 3 feet to 6 feet deep, can be heated for additional fee. Home Theater Room with 8 reclining theater seats on 2 levels, 108 inch screen, wet bar, 1/2 bath located on 3rd floor. Inground Swimming Pool, 3' to 6' deep, heat available if requested Beach Volleyball with sand court Horseshoe pits Basketball backboard Gas Grill Deck and Screened-in Porch Fully Equiped Kitchen with 2 ovens Gas Fireplace Washer and Dryer Flat Screen TVs in each bedroom, 3 HD TV's HD TV Entertainment System in Family Room 3 Play Station IIIs, 2 DVD players Computer with wireless internet 5 bicycles, 3 child's bike WE DO NOT PROVIDE SHEETS, TOWELS, OR PAPER GOODS SUCH AS TOILET PAPER, PAPER TOWELS, ETC. Wonderful, fully appointed house w/ excellent WiFi and TV, bikes, pool, volleyball, lots of extras. We spent our annual family reunion vacation at the Toy Box this year, and it was wonderful. "We" means 20 people, more or less (some could not stay the whole week). Everything worked (which is a bit unusual in our experience), TV with cable in every bedroom, excellent WiFI, a great pool and sand vollyball court. There are 8 bikes in the garage to use, lots of beach chairs, etc. It is a very private setting, with woods buffering on 3 sides near the end of a dead-end street. The pool has a heater if needed, but there is an extra charge for that (understandably). We did use it as our week was unseasonably cool. The house itself is very nicely laid out. Most bedrooms have king beds, 4 with private baths. The theatre room on the 3rd floor was great for the rainy days and keeping kids (and adults) entertained. Kitchen generously equipped, laundry room with really new washer and dryer. Two refrigerators - one in the kitchen, one in the garage. Lots of water pressure even on 3rd floor. The beach is "walkable" if by that you mean about 5 blocks. Some of us drove (parking is $2 an hour in Bethany, or $5 a day at Fenwick Island State Park, 4 miles south) and some of us rode the bikes. Some even rode the 4 miles to Fenwick State Park (which is less crowded than Bethany proper). Lots of stuff to do, from the huge outlet stores in Rehoboth (14 miles north) to the Ocean City boardwalk about 15 miles south, to the quaint Bethany boardwalk within walking distance. One thing for a heads up: they do not provide linens or towels. The owner has a floor plan so you can plan who will sleep where, and what size sheets to bring. Just takes a little planning. When we come back to Bethany, we will try to come here first. Lovely house, well laid out, equipped, and maintained. This was our second year and we plan a third. My only suggestion would be to sharpen the kitchen knives. Two families, 15 people, 13 adults aged 24+ & 2 children under age 6....home is large enough, you have your own private space and never felt like you were on top of one another. The home is on a private road, with maybe 10 homes. There are no homes on either side or across the street, so you really feel like your are secluded. We loved it. All the bedrooms are very large and it is a very open house inside. The home has everything you need! Fantastic in-ground pool with plenty of deck space for relaxing. Seven lounge chairs to stretch out & sun bathe or 8 chairs to sit & dry off after your time in the pool. In addition there is a table with an umbrella and 4 chairs on the patio, next to the screened in porch, which has a nice large table with 6 chairs. Also in the back yard is a sand volleyball court & a horseshoe pit which we used everyday. In the front yard there is a basketball hoop. The home also has 6-7 bikes (2 small bikes for the kids) and beach chairs to use. There are also a number of inflatable pool balls, volleyball net and rafts. We drove to the beach, although you could walk. We found it easier to drive & load the van with the chairs, beach blankets, towels, cooler with food & drinks and our 10 x 10 canopy tent. We HIGHLY recommend this home for your family vacation! We having been coming for several years to this home. We rented different properties over the years but this is our favorite. Close to the beach and activities yet very quiet. Beautiful house! We will be back! What a great house for large groups or family reunions. We absolutely loved this house and we will be back! The rooms are all wonderful sizes. We hope to rent again in the warmer weather and take advantage of outdoor pool and volley ball court. The kitchen was very well stocked. The theater room is amazing. All of the bedrooms were large and the number of beds in the whole sale is awesome! We had a GREAT Winter Weekend in Bethany Beach! This house is easily the best I've ever seen. Our family filled every bed, but it was so spacious, you'd never know there were that many people living there for the week. It was huge- the pictures don't do it justice. 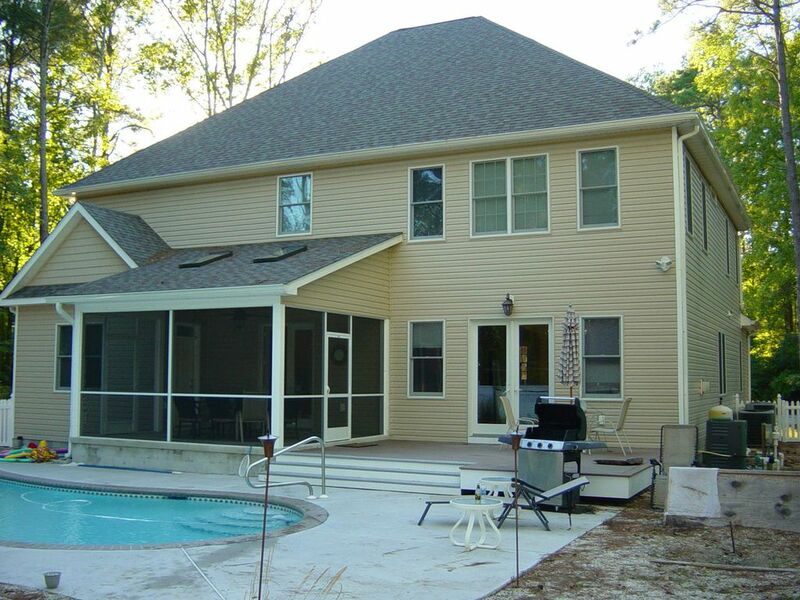 There were so many places to hang out- the pool, screened in porch, deck, living room, dining room, movie room. The kitchen was well stocked with cookware, and the rooms had plenty of storage space. It's obvious this house is well taken care of. It is a bit of a walk to the beach, but they even had bikes we could use. It was just wonderful! Enjoy the activities provided at the house or take a walk to the beach. Several golf courses are located within 1/2 hour of the property. Bethany's boardwalk and shops are just a few minutes away. There is often live music playing at the ampitheater on the boardwalk. The towns of Dewey Beach and Rehoboth Beach are a short drive up Coastal Highway. Ocean City, MD with amusement rides, arcades and a popular boardwalk is 9 miles to the south. Fishing, kayaking, boating and water sports are all available in the resort area. Nightly Rate: $550 - $600 plus $225 Cleaning fee.